With Facebook’s temporary profile picture feature, you no longer have to remember to switch your profile picture back after a holiday or observance–they’ll do it automatically for you. Why Set a Temporary Profile Picture? For several years now, millions of people have used their Facebook (and other social media profile) pictures as a tool for political protest (such as those supporting marriage equality in the United States), solidarity with groups (such as the victims of the Paris terror attack in 2015), and to otherwise draw attention to causes, people, and holidays in their culture. 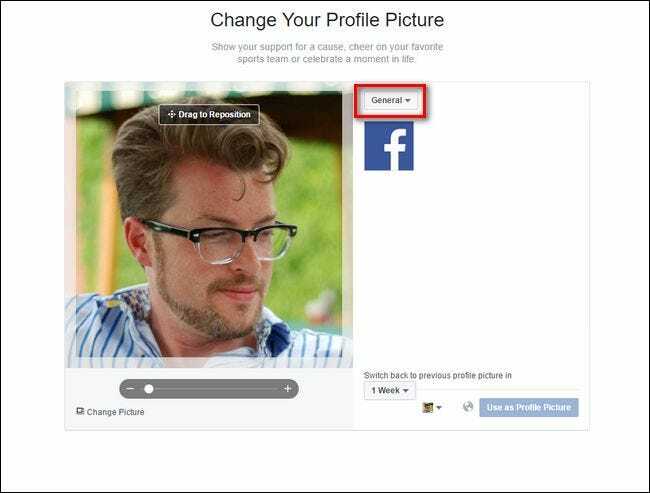 Originally, you had to manually change your profile picture for such purposes–either uploading your own photo or using a Facebook app to create/authorize it–and then manually change your profile picture back. This meant that if you forgot to change your just-for-St.-Patrick’s-Day profile picture you could find yourself staring at a green-bedazzled photo next Thanksgiving. With the temporary profile picture feature, however, you can easily revert your profile within an hour (on the short end) to within years (on the long end)–so remembering to switch your profile picture after a period of observance or celebration is thing of the past. 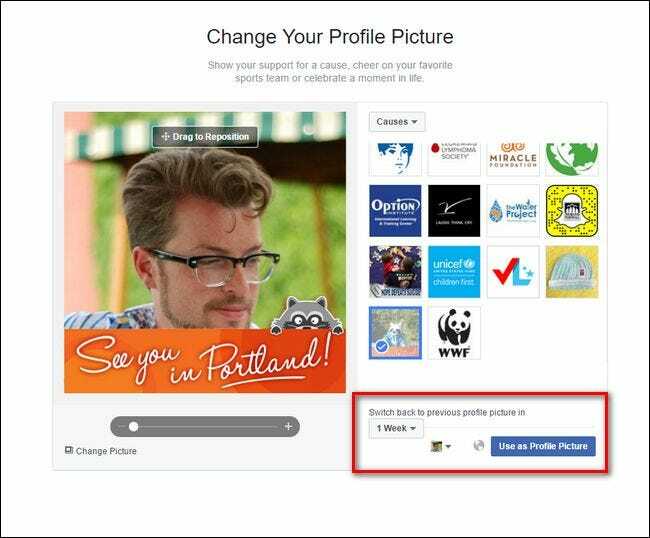 Let’s take a look at how to set both a temporary profile picture and the even newer feature, temporary profile photo frames. 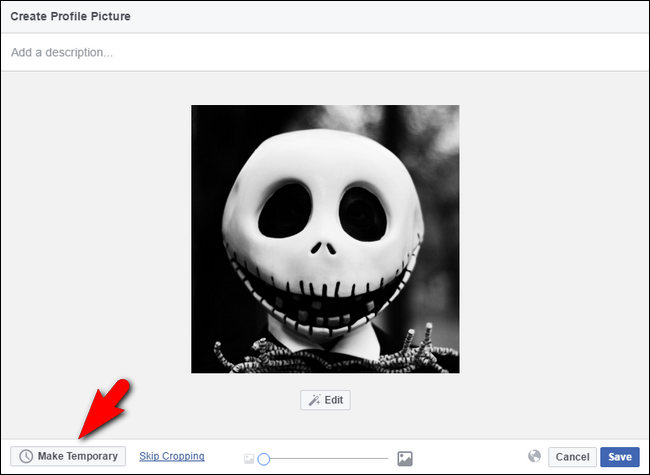 To set a temporary profile picture, log into your Facebook account and look for the “Edit Profile” link near the top of the left hand navigation column. On the profile editing page, click on your profile picture to change it–when you hover over the image with your mouse, you’ll see the “Update Profile Picture” indicator, as seen below. Here you can select from any number of pictures just like with a regular profile change: you can upload a new photo, snap a picture with your webcam, or use a previously uploaded photo. We’re going to upload a new photo because we’re so pumped about Halloween we could kick ourselves in the face. Meet Jack–totally our 2014 Halloween costume–Skellington. Regardless of your profile picture source (or your level of excitement about Halloween), click on the “Make Temporary” button in the lower left corner. In the resulting drop-down menu you can opt for increments of 1 hour, 1 day, 1 week, and “Custom”. You can also click “Never to easily back out of temporary mode without starting over. You can select from one of the presets or set a custom date. The custom date allows you to set any date you want between the present moment and 12/31/2299 at 11:59PM. Why that time? No idea, but we tried to set a “temporary” profile to expire in the year 9999, got an error, and then walked the date back until we found the furthest date it would allow. Remember gentle readers, everything we do, we do for you. Because this particular profile picture is very Halloween-centric, let’s set the date of expiration to the first of November. Click “Set” to confirm the date and time, then click “Save” in the main profile picture and you’re done. Now the day after Halloween our Jack Skellington profile picture will revert to our previous profile picture without any intervention our behalf. In addition to updating the profile picture system to support temporary picture changes, Facebook also has a “frames” feature where you can add a frame overlay to your profile picture to show support for a social cause, organization, sports team, or other subject. To access the frames system, log into your Facebook account and navigate to this Profile Picture Frames link. At first, the feature might seem kind of dull, but that’s because you are, by default, set in the “General” category which just has a few generic frames. Click in the drop down menu located near the upper right corner of your profile picture to change the category. There you’ll find options like various sports organizations and divisions, “Gaming”, “Causes”, and “Movies”, among others. Select the frame you wish to use. Our example, seen below, is an awareness banner for the World Parkinson’s Coalition conference in Portland. (As an aside, it would be nice if there was a little summary box for each icon so you didn’t, say, mistakes this particular frame for a Portland tourism campaign.) Once you’ve selected your frame you can click on the “1 Week” dropdown menu to adjust how long you wish to keep the frame in place, just like we did for the temporary profile picture in the previous section. Just like with the total profile picture change, the frame will expire at the date specified and your profile picture will revert to its previous state. 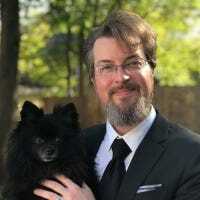 With just a little tweaking, you too can set temporary profile pictures that share your opinions, passions, and grievance for a window of time before reverting your profile to its prior state.